Talkin’ ’bout a Revolution copy of the slideshow and notes from a talk we did at the Leicester Comedy Festival in February 2015. Sorcery, Rupture and Fairy Dust a recording of a talk in Manchester to launch Moments of Excess. A couple of radio interviews from our short US tour to promote Moments of Excess. The first, about 20 minutes long, was on KPFA, on Tuesday 15 March. The second, also on KPFA a couple of days later, mostly took the form of the host, Chris Welch, reading out passages from the book (as we squirmed) and then asking us to comment. It’s about 30 minutes long and concludes with a select group of the show’s listeners phoning in to put their own questions. Also from the same tour is this much longer presentation we did as part of a ‘Shaping San Francisco’ public talk series at CounterPulse, along with Aaron Benanav, Robert Hurley, David Solnit, Caitlin Manning, and Gifford Hartmann. 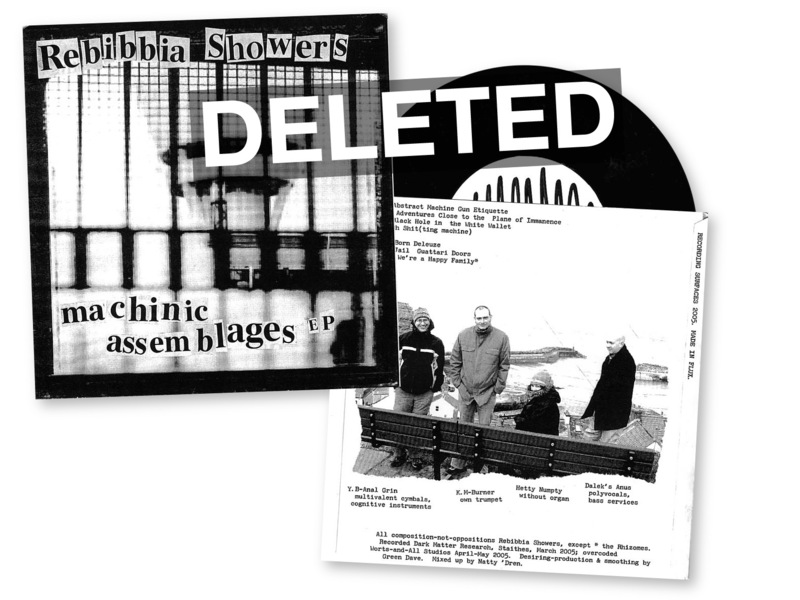 Machinic Assemblages EP Seven track EP released May 2005 under the name Rebibbia Showers. Paris 2003 a taster of our workshop at the European Social Forum, Paris, November 2003.